Gabriel Faure, composer, was born on May 12, 1845 in Pamiers, France and died on November 4, 1924 in Paris. Because he lived at the end of the Romantic Period (1825-1900) in music and the beginning of the 20th Century, his music falls into both periods. Comparing him to other composers in France, for example, he was born after Cesar Frank (1822-1890) and Georges Bizet (1838-1875) but before Claude Debussy (1862-1918) and Maurice Ravel (1875-1937). Faure is best known for his Pavane, Op. 50 and Requiem, Op. 48. Sicilienne was originally written in March, 1893 as part of the Incidental Music for Moliere’s (1622-1673) Le Bourgeois Gentilhomme (1670) but was never used for that purpose; it was then used as a Solo for Cello (or Violin) with Piano Accompaniment and first published in April, 1898, as his Op. 78, with a dedication to the British Cellist William Henry Squire (1871-1963). Faure also included it in his Incidental Music (first performed in June, 1898) for Maurice Maeterlinck’s (1862-1949) 1892 drama Pelleas et Melisande - a work which inspired many composers to write music for : Claude Debussy in 1902, Arnold Schoenberg (1874-1951) in 1903 , Jean Sibelius (1865-1957) in 1905 and Cyril Scott (1879-1970) in 1912; however, Faure was the first. The Pelleas et Melisande Suite (Op. 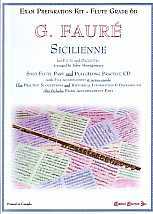 80) for Orchestra is made up of 4 selections from the Incidental Music, with Sicilienne as the third selection. A Sicilienne (in Italian Siciliano; in English Sicilaina) is an Italian dance, usually in a minor key, in the meter of 6/8, which uses the distinctive rhythmic figure dotted eighth, sixteenth, eighth. This rhythmic figure, of course, occurs in many other pieces in 6/8, Greensleeves and the Christmas Carol Silent Night are two examples. In this arrangement all of the rhythmic values have been doubled and the meter changed to 3/4 (the Sicilienne rhythm has, therefore, changed from dotted eighth, sixteenth, eighth to dotted quarter, eighth, quarter). The Incidental Music for Pelleas et Melisande was orchestrated by Faure’s pupil Charles Koechlin (1867-1950) and scored for 2 Flutes, Oboe, 2 Clarinets, Bassoon, 2 Horns, 2 Trumpets, Timpani, Harp, and Strings (1st Violin, 2nd Violin, Viola, Cello and Bass). For the Pelleas et Melisande Suite, Faure later revised the orchestration (in all but Sicilienne) adding a 2nd Oboe, 2nd bassoon and 3rd & 4th Horns - this arrangement has eliminated 2nd Flute, Oboe, 2nd Clarinet, Trumpets and Timpani.